FUTURES Foundation for Volusia County Schools announced its 2018 First Year Teacher Award recipients during its annual recognition event April 9 at Mainland High School’s Auditorium. Melissa Diamond, a 5th grade teacher at Forest Lake Elementary School, received the Elementary level First Year Teacher Award while Julian A. Gutierrez, an 11th and 12th grade teacher from Mainland High School, received the Secondary level First Year Teacher Award. Forest Lake Elementary School is located in Deltona while Mainland High School is in Daytona Beach. This year’s reception, co-sponsored by FUTURES and Volusia United Educators (VUE), featured refreshments prepared and served by the Mainland High Culinary Academy. Ms. Diamond and Mr. Gutierrez were selected for their awards from 47 nominees who were chosen to represent their schools. To be considered for the recognition, nominees must have earned a Baccalaureate degree, started a full-time teaching career on or after Jan. 1, 2017, performed outstandingly based on standards established by the Volusia County School District and been nominated by their school principal. Christy Mahaney, Specialist from the Volusia County Schools Professional Learning & School Improvement, provided insights into each nominee’s enthusiasm and dedication to their students as they were recognized on stage. Nominees received a special motivational speech by 2019 Volusia County Teacher of the Year Nicole Grebosz from Citrus Grove Elementary School. Two additional special guests included Nicklaus Conrad and Shannon Salisbury, the 2017 Elementary and Secondary First Year Teachers Award recipients, respectively, who also addressed the nominees and presented the 2018 awards to Ms. Diamond and Mr. Gutierrez. 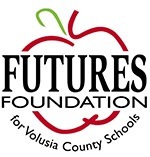 FUTURES Foundation for Volusia County Schools, a non-profit direct support organization founded in 1985, engages business and civic leaders to promote and achieve educational excellence for Volusia County Public Schools. FUTURES’ volunteer board of directors consists of business and community leaders who raise funds and awareness in support of educational and recognition programs. Its vision is for all Volusia County Public School students to be equipped and prepared for college or career success. Through business and individual donations, FUTURES presents programs such as the First Year Teacher Awards. 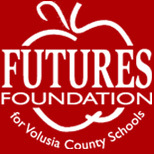 For additional information about FUTURES, please contact Executive Director Cynthia Ramirez at 386.255.6475, ext. 50730, or caperric@volusia.k12.fl.us, or visit its website at www.FUTURESVolusia.org.